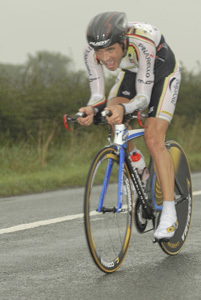 Would Jason MacIntyre (The Edge RT) still be the British Time Trial champion if he had not fallen by the wayside with mechanical trouble on Sunday at Holmes Chapel? Brought to a stop at around 16 miles with, as he says “a mechanical problem”, the Scotsman’s dreams of retaining the title he won last year died. Back in the changing rooms spectators and some of his supporters who had made the long journey down to England to cheer him on were adamant that when he had bowed out he was some 20 seconds ahead of eventual race winner David Millar (Saunier Duval). 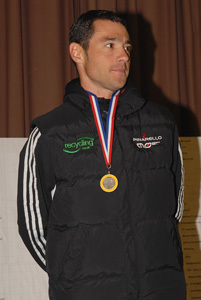 MacIntyre, who successfully defended his Cycling Time Trials national `25` title in June when he had a 17 seconds advantage over silver medallist Michael Hutchinson and 1-03 over third placed Chris Newton, was out to grab the attention of the selectors. “But all the time checks in the world are worth nothing if you don’t finish, are they?,” a glum MacIntyre said as his supporters offered their commiserations. MacIntyre is looking for World’s and Olympic selection for the time trial. 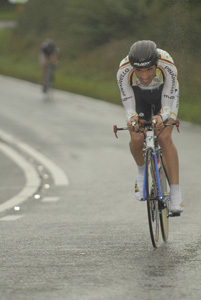 While MacIntyre was out of it fellow Scotsman David Millar ruled the roost adding the British Time Trial Championship to the National Road Race Championship title he won in August, a unique double. Millar showed back in 1994 that he was a dab hand at time trialling when as a junior he won the National Championship `25` for juniors, beating Ceri Pritchard and Matt Bottrill. This time out in the 28.4-mile championship he took the scalps of Chris Newton (Recycling.com) and Michael Hutchinson (In-Gear Quickvit RT), Millar’s 56-57 leaving former world track champion Newton at 1-32 and `Hutch` at 3-13. Premier Calendar winner Newton was third behind MacIntyre and Hutchinson in the 2007 25-mile championship, loosing 1-03 to the Scotsman while Hutchinson lost by 17 seconds.